In 1949, William Larimer Mellon founded the Graduate School of Industrial Administration, three years after the the Carnegie Institute of Technology hired economist George Bach to revamp its economics department. In early 2004, the AACSB-accredited business school received a $55 million donation from David Tepper, which led to the school officially changing its name to the David A. Tepper School of Business at Carnegie Mellon. Tepper donated another $67 million to the university in 2013, which helped develop the Tepper Quadrangle on the north end of the school’s campus. The business school also helped the eventual development of Heinz College in the 1960s and the Carnegie Mellon School of Computer Science in 1988. The Tepper School of Business is located on the southeast portion of the Carnegie Mellon University central campus in Pittsburgh, Pennsylvania. The business school is located around 20 miles away from the Pittsburgh International Airport. Posner Hall is the main building of the Tepper School of Business. Among other amenities, Posner Hall is home to classrooms, the Career Opportunities Center, the admissions office, multiple conference rooms and auditoriums, and a deli. Since graduate housing is unavailable, Tepper students rent or buy housing in nearby neighborhoods. Roughly 70 percent of Tepper students live in Shadyside, an upscale residential neighborhood only a mile or so from campus. Tepper’s full-time MBA program boasts a student-to-teacher ratio of 5:1, and overall employs nearly 150 faculty members. Aside from teaching classes, these faculty members contribute to Tepper’s nine research centers, whose research and resources cover topics like international management, green design and entrepreneurship. The Tepper School of Business Online MBA program features 137 students, 70.1 percent of which are male. The average student in the program is 29-years old, scored 669 on the GMAT, and had a 3.3 undergraduate GPA. Tepper offers a traditional full-time MBA program, as well as a Part-Time Online Hybrid MBA, and a part-time MBA that can be taken at its Pittsburgh campus. The Online Hybrid MBA includes on-site classes every other month, hosted by Carnegie Melon locations across the U.S. Studies are rounded out with live, online courses and independent work. 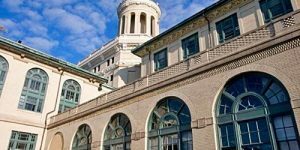 Students may pursue an MBA from Tepper concurrently with a master’s in Engineering, Software Engineering, Healthcare Policy, Public Policy, or Engineering at other schools within Carnegie Mellon University. There is also a JD/MBA option with the University of Pittsburgh School of Law.